The true power of spreadsheet programs is that they let you quickly try out various scenarios and see what will/could happen. This is especially helpful in budgeting. With my slow start to my savings plan this year, I spent some time yesterday trying to figure out how to ensure that my Long-Term Savings Plan would stay on track. I cooked up this idea to just start putting cash into my Long-Term Account on schedule and keep putting a set amount into it no matter what. That way, by the end of next year (2019) I would have enough saved up to buy my land. Sounds good, right? The trouble with this plan is that it underfunds my Mid-Term Account, as I would just put in what extra cash I could spare into it. This would leave this account underfunded, and it would not be fully funded until about the same time. You have (or should have) three bank accounts, as each one serves a different purpose. The first is your Main Account, this is your primary account where you do most of your banking from. This is where you put your paycheque into and where you pay your bills out of. Your second is your Mid-Term Account, this is your “rainy day fund” or where you go for emergencies. Trust me, this is an important one to have. Your third account is your Long-Term Account. This account is for you to save up for your long-term goals and dreams, such as a down payment on a house, college education, buying land and paying cash, etc. These accounts are shown as buckets because they should keep some cash in each of them, but for different reasons. Your Main Account should have some cash left in it at all times, this will be your own Personal Overdraft. By training yourself to see that a certain amount of cash in that account is actually “Zero” then you can have a bit of a cushion to dip into (for free) if you need to tide yourself over between paydays. I recommend building this up to $1000.00 because it is easiest to just lop off the $1000.00. You then see that if it says that you have $1002.35, that you actually have $2.35 in there. Your Mid-Term Account is your own Personal Credit Card. This is where you borrow your own money from (for free) if you need it. This is vital, because unless you break the cycle of running to credit every time you have an emergency, then you will never get out of debt. Your Long-Term Account should be an investment account of some kind. You know, the kind that takes a day or two to get cash out of. 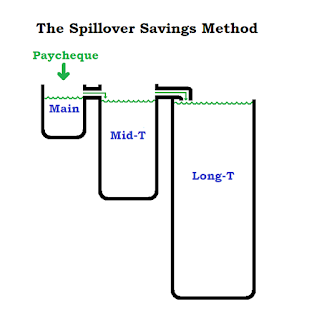 At that time, you will then “spill over” the extra cash into your Mid-Term Account. This bucket fills up until you have reached your target amount in this account. 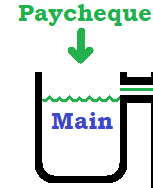 This is shown as an even pipe to demonstrate that cash flows back and forth between these two easily and freely (when needed). Once you have filled your Mid-Term Account until it is full, then you start spilling over to fill up your Long-Term Account. This is shown as a drop, as once cash goes into the Long-Term Account, it should stay there, until you are enacting your dream/goal, that you have been saving for. If at any time you draw down on one of your buckets, you fill the buckets, up in order. So if you dip into your Main Account’s Personal Overdraft, then you have to fill that one back up to its target amount. Then you can continue to spill over to your Mid-Term Account. If that one has been dipped into, then you need to fill it up before you can resume putting cash into your Long-Term Account. If you are trying to get out of debt, I strongly recommend that you at least give yourself that Personal Overdraft in your Main Account, and then focus on your debt elimination. All of this hinges on you having extra cash in your monthly budget. Cash flow is everything. You need to know how your cash flows, and find ways to save. Otherwise you will stay on that hamster wheel of debt until you die. 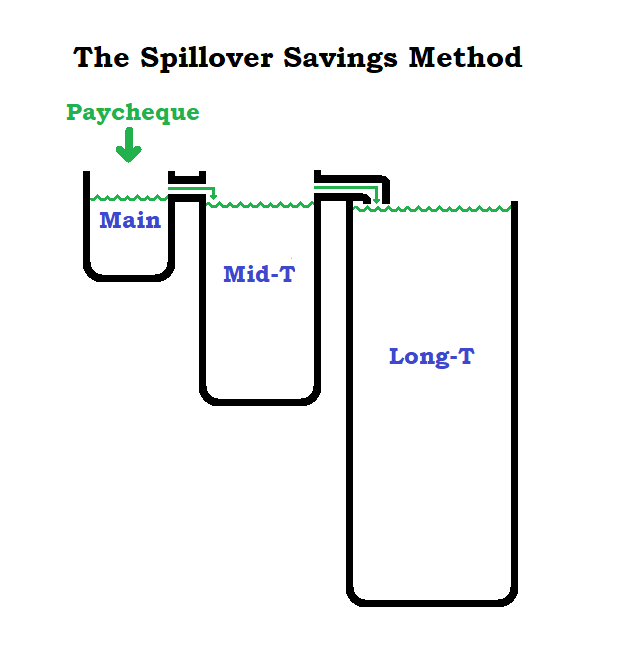 Anyways, on that happy note, I will leave you with this explanation of my simple Spillover Savings Method, one that I have recently re-dedicated myself to.